This time we are using Nathalie's Stand Up Bass. 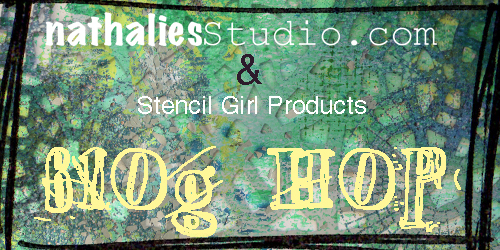 For some reason this stencil made me think to my papercrafting background so I thought I'd make you a card that would be a perfect all occasion card to have on hand. 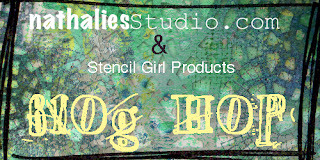 That is the fun thing about StencilGirl stencils--they are so unique that the work perfectly for all different types of art. 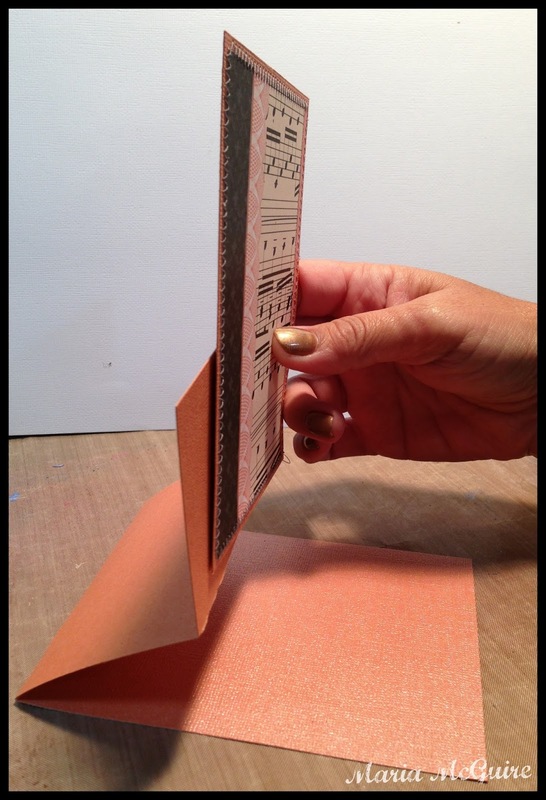 This type of card is an easel card which when folded down is a A2 size card and will fit into a standard envelope. It happens to be one of my favorite types of cards to make. 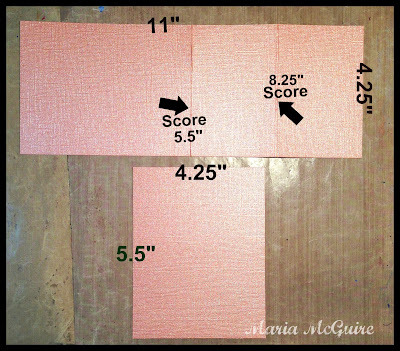 Following the dimensions in the photo below cut and score your cardstock. The smaller piece of cardstock will provide your card face. Below is a visual of how to fold your larger piece. Adhere only the bottom of your card face to the base. To make the card stand up, cut a decorative piece of pattern paper to 4" x 2.5" and add 3-D foam tape to the back. This will give your card somewhat of a ridge to rest in when standing up. 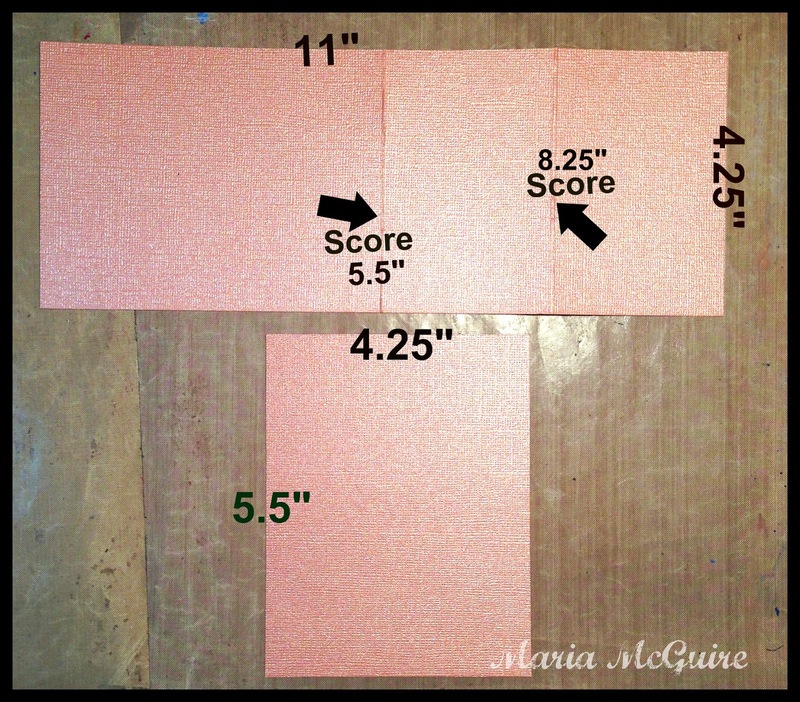 I also cut a piece of the patterned paper to 4" x 5/25" inches for the face of the card. 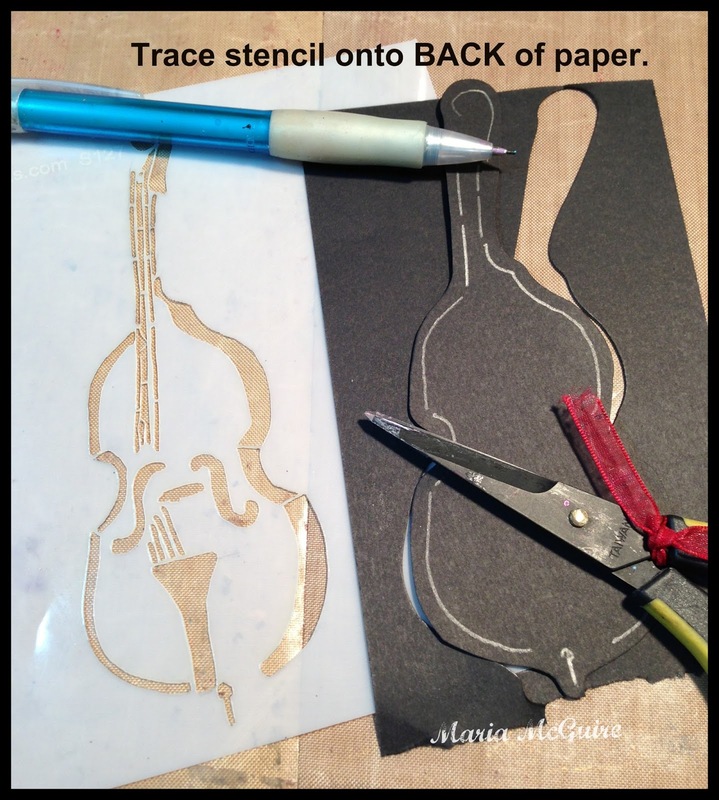 Let's move on the the star of the show--THE STENCIL!!! 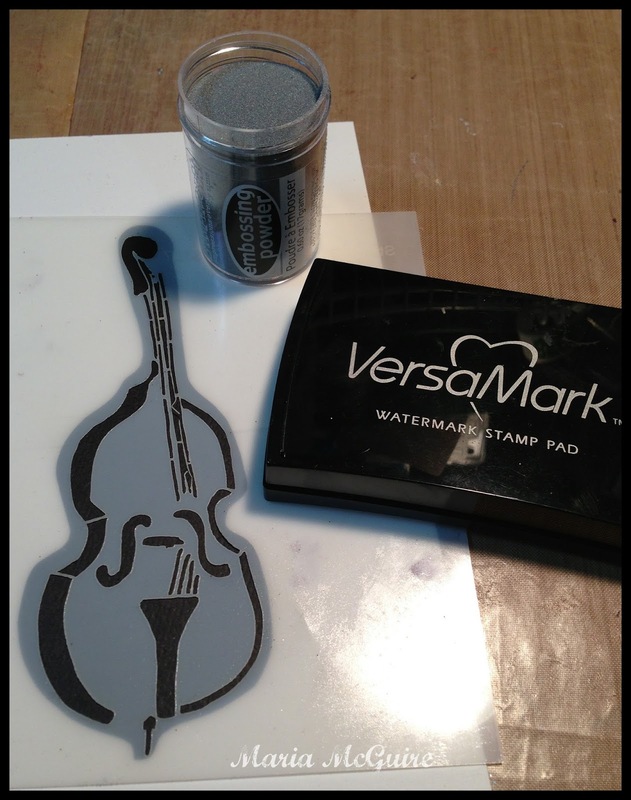 I traced the Stand Up Base stencil onto the BACK of my black cardstock so when reversed it would be going in the direction I wanted and cut it out .I turned over the cut out bass and stamped VersaMark ink through the stencil onto the black and then embossed with silver embossing powder. Foam dots were also put on the back of the bass and sentiment. A little ribbon and stitching and I was done. Thanks to Nathalie for having me participate in her hop. but before you do....make sure you leave a comment here because Nathalie will be picking one lucky winner to receive a Stand Up Bass stencil of their own and ALL comments in the hop are eligible! Such a gorgeous and beautiful card- this so rocks!!! Thank you Maria! a really lovely easel card. 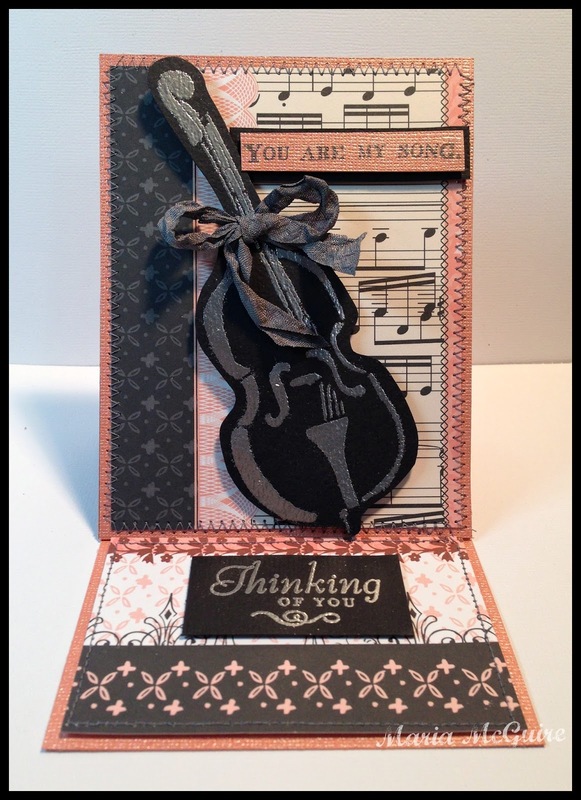 Your card is beautiful and the sentiments you chose are perfect! Fabulous card! 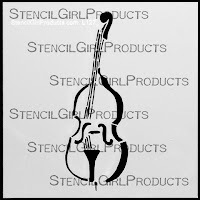 Love everything about it right down to the ribbon tied around the neck of the bass! Beautiful! I want to make this card for my friend who plays this insrument. Love it. Such an elegant card. how beautiful. What a pretty card. Always hard to find something for musicians. This stencil will definitely be useful. Love the technique. Would love to win this stencil. I like how you incorporate different techniques, loving the stitching. Elegant card and it is a good use for the stencil. Actually, all the blogs have shown just how versatile this stencil can be. I love the easel card idea. You did such a nice job with it. Thanks for the tutorial. Really love the use of the Versamark pad. I've got one but haven't used it yet. Will have to give it a go. 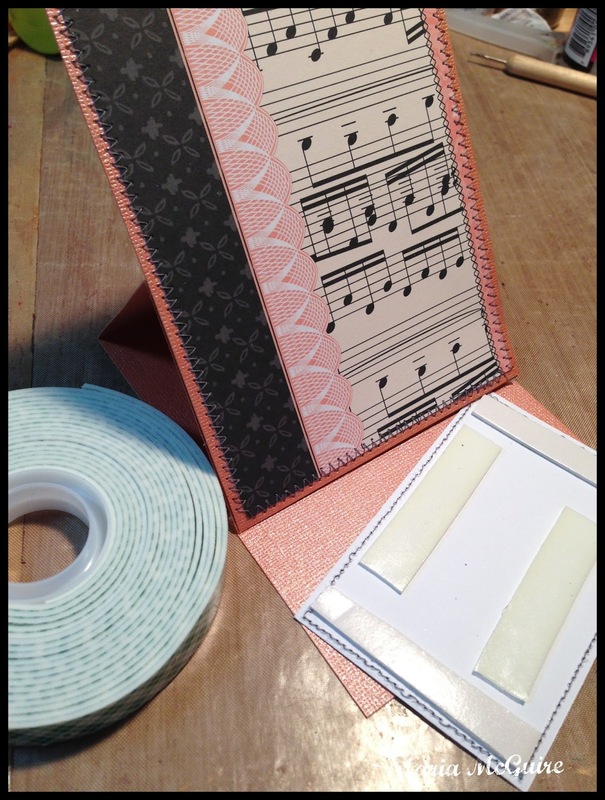 Magnificent card that makes music of its own! Your cards are so full of little details that make them absolutely amazing! 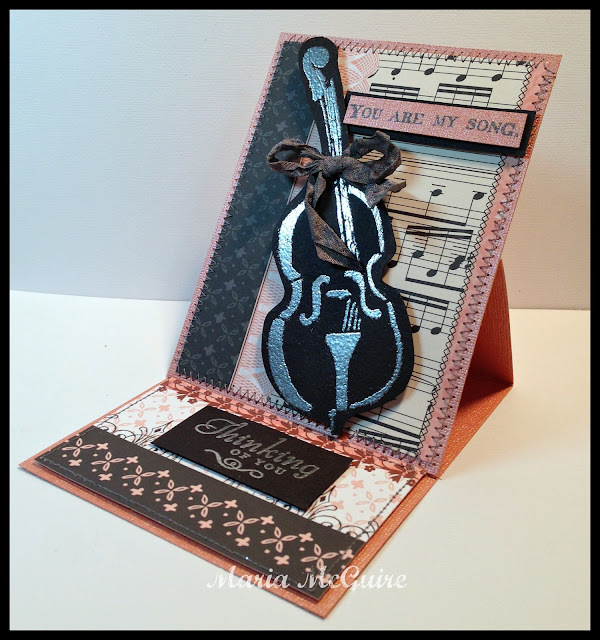 I love to make cards and this one is exquisite. Thank you for the inspiration. Beautiful card, Maria! Love how you used the stencil as an accent piece, and that sentiment 'you are my song' is just lovely. This is a great card. Love the way the bass stands out. What a classic card...the stand up bass is gorgeous and your title fits so well. Love the pewter embossing and gray ribbon. Just gorgeous. TFS! but beauty, I love the color scheme, I love the card is tender even having a dark color, it's beautiful! Maria, you did such a beautiful job using black and pink! I never thought about using versamark overf the stencil. Thanks for teaching me something new today!